Washington University neurosurgeons are tackling brain tumors at Barnes-Jewish Hospital with a new laser probe. 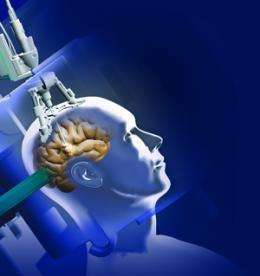 The tool is an MRI-guided high-intensity laser probe that “cooks” cancer cells deep within the brain, while leaving surrounding brain tissue undamaged. Barnes-Jewish Hospital is the third hospital in the United States to have the device. Ralph G. Dacey Jr., MD, chief of neurosurgery at Washington University School of Medicine, and Leuthardt used the new system for the first time last month in a procedure on a patient with a recurrent brain tumor located deep in the brain. Previous surgeries coupled with the hard-to-reach location of the tumor made a standard tumor resection surgery impossible, says Leuthardt, also director of the Center for Innovation in Neuroscience and Technology at Washington University. In last month’s procedure, the surgeons drilled a small burr hole about the diameter of a pencil through the patient’s skull, and then used MRI scans to guide the thin laser probe through the brain into the tumor. The tool, Monteris AutoLITT, received FDA approval for neurosurgical use in May 2009.